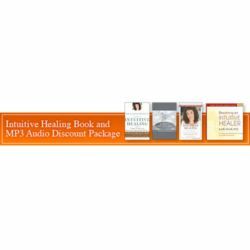 This special Intuitive Healing Book and Audio Discount Package offers a unique learning opportunity by making Dr. Orloff’s books and tapes on intuition immediately accessible to you. We hope you enjoy this knowledge and that it empowers your life. 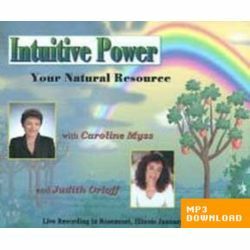 Guide to Intuitive Healing book signed by the author! Doctors, nurses, bodyworkers, and therapists have all felt it at least once the uncanny gut instinct about what’s ailing a patient or client. But what if there were a way to consciously tap this intuitive power and make it a regular part of diagnosis and treatment? For over twenty years, Dr. Judith Orloff has pioneered the use of intuition in healthcare. With Becoming an Intuitive Healer, she now presents a full-length audio workshop on the indispensable role of intuition in healing. The use of intuition in healing is rooted in the universal ability to receive and process information in both linear and nonlinear ways, begins Dr. Orloff. The linear, or analytic, mind plays an essential role in understanding the didactic knowledge and training specific to the healthcare profession. However, there is an infinite amount of wisdom that we cannot access through logic alone. Instead, we must learn to rely on our nonlinear, or intuitive, mind to create a complete picture of the person we’re trying to help. Becoming an Intuitive Healer provides you with detailed instruction in every phase of intuitive healing, including how to make a diagnosis, the basics of energy healing, protecting yourself from burnout, working with subtle energy and intuitive empathy, and much more. The days of going to the doctor to find out what’s wrong and how to fix it are thankfully coming to a close, explains Dr. Orloff. Today, an ever-increasing number of healthcare practitioners recognize the vital need for an “us” in the therapeutic relationship. Recorded at an in-depth four-day training, Becoming an Intuitive Healer gives you all the skills and insights required to use your intuition in conjunction with conventional knowledge. The result: a wholly balanced practice that considers the physical, emotional, and spiritual aspects central to your patients total well-being. 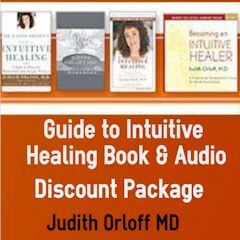 In this abridged audio cassette version of Dr. Orloff’s bestselling book Guide to Intuitive Healing, Dr. Orloff presents a revolutionary argument for the integration of intuition and classical forms of Western medicine. She passionately believes that “the future of medicine lies in the integration of our body’s subtle energy system, the wedding of heart and mind.” Intuitive Healing offers such a marriage. 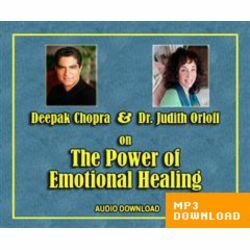 In her vigorous and caring voice, Dr. Orloff explains how intuition can be used to heal our bodies through pain control and early self-diagnosis; our emotions and relationships by breaking through stress and depression; and our overall vitality by embracing our sexuality as a vital energy source. This groundbreaking book, geared to health-care professionals and general audiences alike, legitimizes intuition as a dynamic therapeutic tool. Dr. Orloff presents a revolutionary argument for the integration of intuition and classical forms of Western medicine. She passionately believes that “the future of medicine lies in the integration of our body’s subtle energy system, the wedding of heart and mind.” Intuitive Healing offers such a marriage. 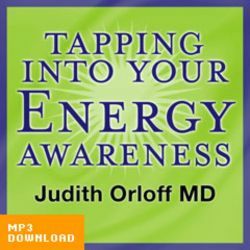 In her vigorous and caring voice, Dr. Orloff explains how intuition can be used to heal our bodies through pain control and early self-diagnosis; our emotions and relationships by breaking through stress and depression; and our overall vitality by embracing our sexuality as a vital energy source. This groundbreaking book, geared to health-care professionals and general audiences alike, legitimizes intuition as a dynamic therapeutic tool. This practical, empowering 12 page workbook guides you though Dr. Orloff’s five steps to Intuitive Healing, offering questions for reflection behind each section to access your knowledge. The work book is divided into these potent intuitive steps.